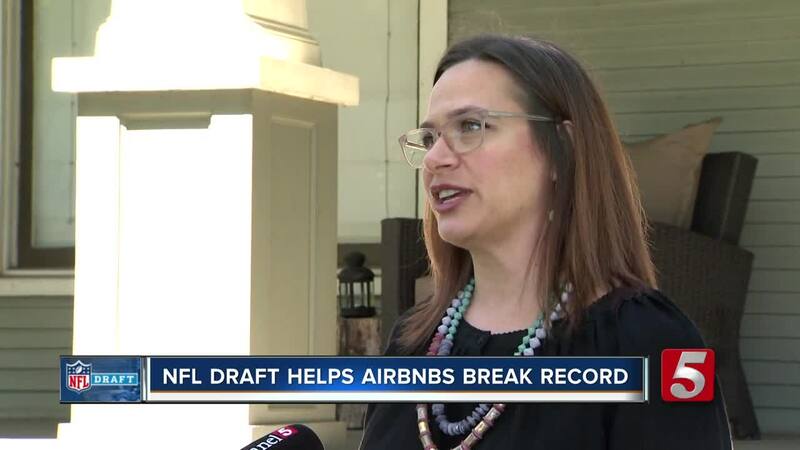 NASHVILLE, Tenn. (WTVF) — More than 21,000 guests will be staying at Nashville Airbnbs during the NFL Draft. Airbnb says Nashville hosts will earn a combined $5 million in supplemental income. The hospitality service says the data, which was released Monday, reflects current confirmed bookings during April 25-27 – which coincides with the Draft. “This will represent the largest number of guest arrivals and local host income to Nashville in the history of Airbnb’s platform,” Airbnb said in a release. "Serve as an Ambassador for Nashville: Many visitors may be experiencing Nashville for the first time -- and our shared hope is that this event can infuse a lasting economic impact by encouraging them to come back again and again. Hosts can help realize that vision by providing an amazing -- and safe! -- experience that will have them already planning their next trip to the Music City."